Doteveryone’s one-day event filled with inspirational and practical ideas to embed responsible technology across the technology industry. 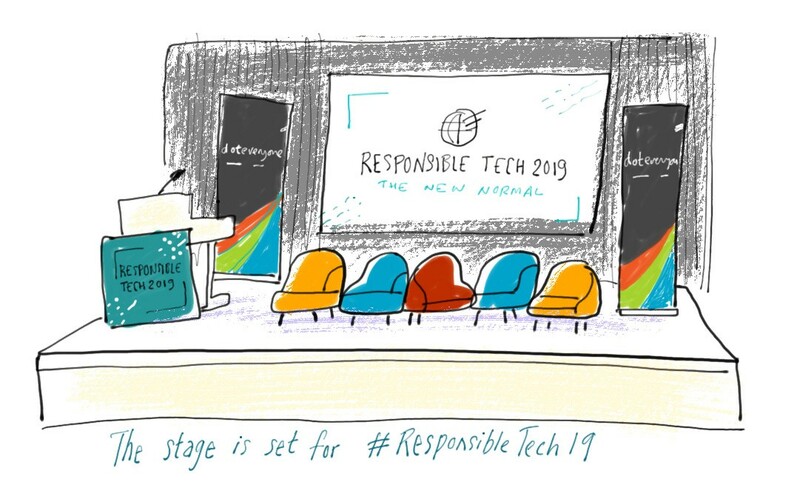 At Responsible Tech 2019: The New Normal, Doteveryone brought together experts and practitioners from across technology, policy, data and ethics to discuss how to embed responsible technology into day-to-day practice. The day had a jam-packed agenda, with over 30 speakers and together with the audience they generated incredible energy and real momentum for driving change. What is Responsible Tech and why do we need it? Mark Martin, Cofounder of UK BlackTech, revealed the shocking statistic that only 2.9% of the tech sector are BAME and not a single tech leader from a black or minority ethnic background British BAMEs in tech leader positions. Mark Martin — What is responsible tech and why do we need it? Hayden Wood shared the dilemmas of putting responsible tech into practice at Bulb, a fast-growing energy provider. Hayden Wood — What is responsible tech and why do we need it? And Rashida Richardson of AI Now spoke of responsible tech as striving for equity not equality. Rashida Richardson — What is responsible tech and why do we need it? What does a world look like where Responsible Technology is the new normal? Julie Dawson, Director of Regulatory and Policy at Yoti, explained how it’s possible to build a digital identity company with a focus on transparency and trust. Julie Dawson — What does the world look like where Responsible Tech is the new normal? Then DCMS Secretary of State, Jeremy Wright, spoke about how “trust is the lifeblood of any digital economy, and building it should be a shared effort… People need to see the risks mitigated, but also to see the good tech can do”. He also announced new government initiatives to support technology that tackles social challenges — the full transcript of his speech is available here. How do we put the Responsible Tech agenda into practice? Veronique Lallier explained how, at Hi-Rez Studios, they focus on the welfare of their gaming communities by looking at how their products are used and then developing them iteratively to ensure players are still enjoying them. Jeremy Silver, CEO of Digital Catapult, described how they have an ethics steering group which has come up with a framework to help companies consider their unintended consequences. Forty people joined Sam Brown in the premiere of our TechTransformed resources to make better technology. They took part in a new Agile event designed to help organisations reflect on their impact and consider the potential consequences of the tech they build. Premiere of Doteveryone’s Agile event. Jay Owens debated with Mat Morrison whether surveillance will steal your souls and Azeem Azhar went head-to-head with Alastair Parvin on whether innovation can be good for us all. Kriti Sharma, VP of AI at Sage UK introduced 13 speakers who gave 3-minute takes on what they’re doing to support the responsible tech agenda (click on the heading to watch videos of each talk). What needs to change to get to that new world of Responsible Tech? Diversity and inclusion were key themes throughout the day — Dr Anne-Marie Imafidon MBE, closed revealing the extent of the gender bias in the industry. In a room full of technologists, nobody could name all four women she showed in her presentation — all of whom had made a significant contribution to STEM. Anne-Marie launched the Institute of the Future of Work’s first discussion paper, Equality Through Transition which explores the challenges that AI and other new technologies present to existing frameworks for promoting equality — “not just for individuals, but at the firm level and the systems level”. The day was closed by Doteveryone’s founder and executive chair, Martha Lane Fox. We want to drive real change in the world, because as Martha Lane Fox said when closing Responsible Tech 2019, the majority of the speakers on the day were ‘preaching to the choir’. Acknowledgments: Thanks to Russell Stedman at 325ProductionsUK for the videos, Adrian Barclay from Marles & Barclay for the illustrations and Paul Clarke for the photographs from the day.